In express way Nina MITTELHAM and Theresa KRAFT of Germany secured gold medal at the Junior Girls Doubles Event at the European Youth Championships in Ostrava. In the ultimate stage of the event German pairings overcame Bernadtte BALINT of Romania and Nicole TROSMAN of Israel. Charlotte CAREY of Wales and Kim VERMAAS of Netherlands won bronze as well as Bernadette SZOCS and Irina CIOBANU of Romania. Very fast 3:0 in the final showed that new European Champions were in superb shape. “We were not in danger at any point of the match. We were very active, aggressive and imposed our game,” said Theresa. Last year’s Junior Girls Doubles champion Bernadett SZOCS, this time in doubles with Irina CIOBANU, failed to reach the final of the event in Ostrava. Nina MITTELHAM and Theresa KRAFT in impressive style halted their progress in straight games. “Nina played very good in this match, but we had to forget our performance from the Polish open first and to overcome outcome from there,” said KRAFT. Against Bernadett SZOCS and Irina CIOBANU they started to play very aggressive from the very beginning. “Very important moment was that we had 5:0 in the opening set and imposed our style. We continued to dominate and to play aggressive to preserve the advantage,” explained Nina. 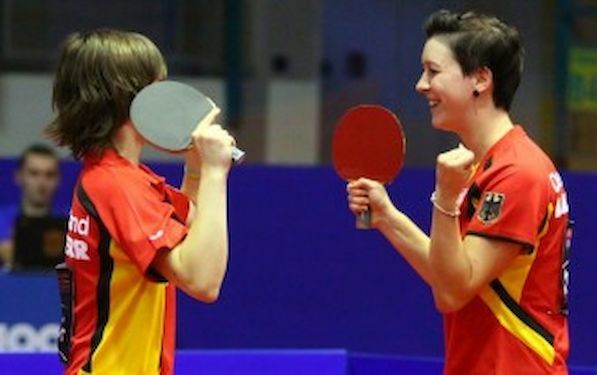 Bernadette BALINT and Nicole TROSMAN overcame Charlotte CAREY of Wales and Kim VERMAAS of Netherlands in the semi final. “It was strange. we expected and prepared for the Serbian girls No one expects to see those adversaries. It was difficult cos we did not know how they play,” said Nikole TROSMAN.